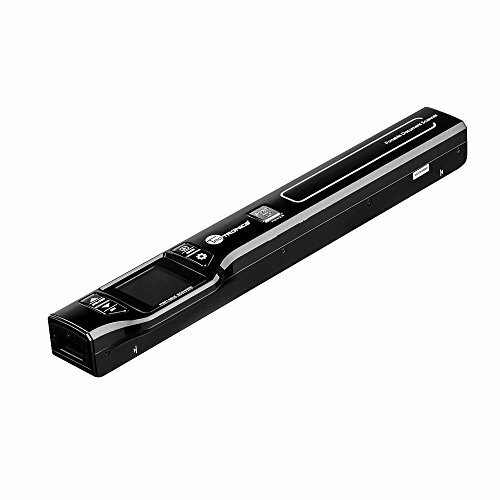 The TaoTronics TT-DS011 Cordless Handheld Scanner is an A4-sized scanner that can scan books, photos, receipts, business cards, or anything flat. Permanently digitize and store all your documents and never lose them again. The scanner comes with a rechargeable 700mAh lithium battery. Perfect if you need to take the scanner with you to the library, office, or on business trips. The built-in 1.44" TFT color screen lets you check how your scan comes out. The scanner has the option of 3 different resolutions (300, 600 and 1050 DPI) depending on how detailed you would like your scans. When you are ready to upload to your PC , you can choose either JPEG or PDF formats depending on what you can. The scanner also supports an SD card up to 32GB to store all your scanned results. The scanner comes with free Optical Character Recognition (OCR) software that converts scanned images into editable text documents(But incompatible with MAC); which you can then share with friends and colleagues. At TaoTronics, not only we offer high quality products, we back them up with 12 month warranty and a 30 day money back guaranty - that's why over 1.3 million Amazon customers have supported us. What's Included: TaoTronics Cordless Handheld Scanner (Model: TT-DS011); USB Cable; OCR CD; Cloth Bag; White Balance Calibration; and a User Manual. Please note that the OCR software does not work on Mac.